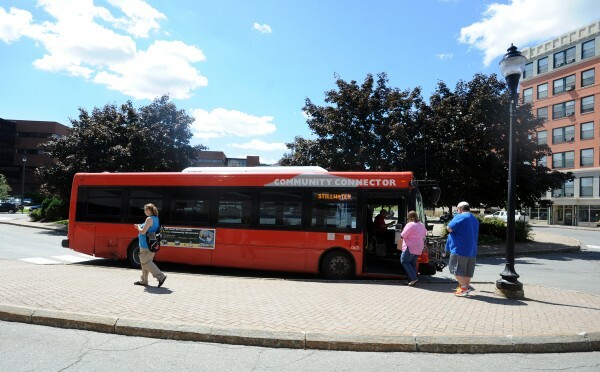 The Community Connector bus in downtown Bangor. This January marks the seventh anniversary of the only New Year’s resolution I’ve ever kept. It has been seven years since I’ve owned an automobile. This would not be noteworthy if I lived in New York or Boston, but I live in Bangor, where the buses stop running at six in the evening and don’t run at all on Sunday. Though some of my friends and acquaintances were supportive, others were incredulous. Don’t you need a car, they asked, to get to work, to the store, to the movies? Don’t you want a car, so that you can go where you want, when you want, without planning ahead or walking through inclement weather? Well, no and no. My hero and inspiration for this resolution is a retired travel writer named Stephen Allen, who in December 2005 was living in Searsport. 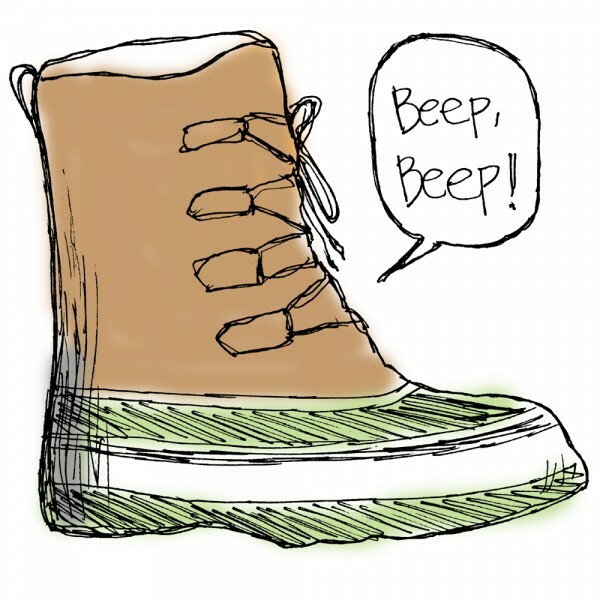 In that month’s issue of Bangor Metro magazine, he wrote of walking into town one winter morning, past a neighbor trying to chisel through a thick layer of ice to get into his car. Half an hour later, as Allen returned from his errands, the man was still there, chiseling away, with 25 feet of driveway to shovel before he could get his car on the road. Allen went on to observe that a ten-day holiday in Paris for two is less expensive than owning a car for a year. This is true: according to the American Automobile Association, the average annual cost of owning a vehicle is more than $9,000. His piece inspired me in more ways than one. It appeared in the fourth issue of Bangor Metro, possibly the first issue I ever saw. The following spring, I contacted the editor, Tori Britton, and I’ve been writing for the magazine ever since. January 2007 was also when I began teaching at the University of Maine. I was issued a “Maine Card” (all students, faculty and staff get them), which, among other things, earns me free rides throughout the BAT bus system. Imagine that — I didn’t need a car to get to work, and I did not need to pay the university’s $50 annual parking fee. A light bulb went on. Like Allen, I was skeptical at first. And, like Allen, I found the inconveniences of not having a car fewer and less troubling than I had anticipated. The benefits far outweighed the drawbacks. I lost 10 pounds and kept them off by walking and bicycling. I bought a 25-foot sailboat, which winters in Hampden and summers in Rockland — and I can get to it via the Concord Coach bus for less than the price of gas. Last summer I attended a writing workshop in Greece, a country I had always wanted to visit, paid for by the savings of not owning a car. Obviously, not everyone can do this. I give a pass to my musician friends who cart heavy equipment from gig to far-flung gig, to those who carry equipment to remote job sites, and to families with small children. But I have heard too many university students whine about being broke all the time while keeping a car on campus for those essential late-night trips to Dunkin’ Donuts. And I’m dismayed when I see major employers like Eastern Maine Medical Center build parking garages along bus routes. Too many people unquestioningly buy into the car-driven lifestyle simply because they have never considered the alternatives. City planners and officials encourage driving by insisting on ample parking for new development, but not bicycle and pedestrian access. Every time I shop at the Bangor Mall, a part of the purchase price of whatever I buy goes toward maintaining the parking lot, which I don’t use. Thus, the non-drivers subsidize the drivers. We’re having a huge fight in this country over so-called socialized medicine, but in most places (the University of Maine is a commendable exception) we already have socialized parking. I’m not a purist. Occasionally I’ll rent a car for a magazine assignment or a trip out of town. In 2013, I rented cars for a total of four days. The cost of this is nominal compared to the cost of the 365-day “convenience” of car ownership, insurance, gas, excise tax, maintenance, repairs, snow tires, and so on. And my whole attitude toward winter has changed. I used to bemoan the shoveling out after storms, the icy roads, the barrier at the end of the driveway after the plow went by. Now I just lace up my boots and go. Henry Garfield has published five novels and teaches writing part-time at the University of Maine.